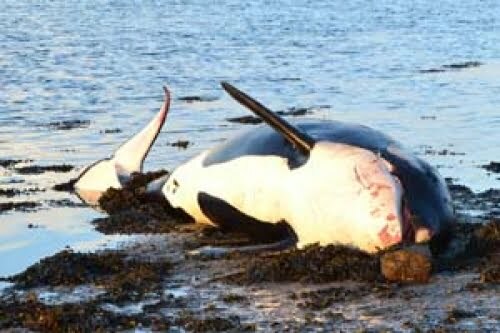 The unusual stranding of a 5 metre female killer whale on the beach at Saleen, near Tramore in Co. Waterford on Friday (30/01/2015) has been in the news this weekend. The whale, which was dead when it washed up, was said to be in “very fresh condition”, according to the Irish Whale and Dolphin Group (IWDG). The whale’s teeth were very badly worn, leading some to speculate that this may have caused feeding difficulties that resulted in its of death. A team from the IWDG and Galway Mayo Institute of Technology (GMIT) was due to perform a post-mortem on Sunday 01 February to attempt to discover a definitive cause of death. No details of the results of that post-mortem have yet been released. This the 15th killer whale stranding recorded in the IWDG’s stranding database. The last such record was from Co. Mayo back in October 2010. January has seen what the IWDG describes as a “disturbingly high” number of stranding records from around the Irish coast. The group recorded 32 stranding events involving 9 identifiable cetacean species during the month. That is double the average number recorded in January over the last five years. Some of that increase, the group speculates, could be down to strong onshore winds in January pushing dead animals that would normally remain at sea onto Irish beaches. However it has also expressed concern on its website that the unusually high number of stranding events could reflect an increase in unnatural fatalities caused by entanglement in fishing-gear and a possible increase in naval sonar activity in the region. Read more about the stranding on the IWDG Website.